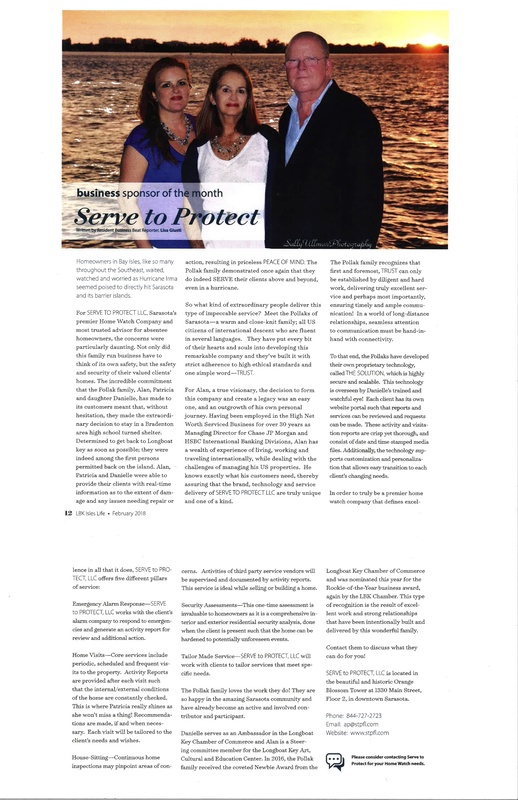 Serve To Protect, LLC is proud to share with you a wonderful article written by Lisa Giusti for the first edition of the LBK Isles Life magazine that came out this February 2018. We are happy to be part of the Longboat Key Community and believe in the importance aligning well with our customers. You can find our ads in LBK Isle Life, and 2018 LBK Chamber Visitor’s Guide. We are often asked “what” we do, and seldom “why” we do it, We believe this article will clarify the “why and who we are”. Please feel free to contact us! A Tip from STPFL on mitigating remedies for frozen pipes up north. MITIGATION REMEDIES FOR SUSPECTED FROZEN WATER PIPES. As you probably heard by now, JFK terminal 4 baggage claim was flooded this afternoon due to the freezing of the main water pipe. As we hibernate in SRQ this extraordinary winter season, this event highlights the true predicament of the absentee homeowner. Is one of our homes safe when we are enjoying the benefits of our seasonal second home? The purpose of this short note is to not inform ourselves about how to winterize our homes. You have probably done this before leaving and we do not wish to waste your valuable time by irritating you with this type of Monday morning quarterback talk. We wish to nevertheless mention some useful steps you may wish to take next week, as the weather starts warming up and our pipes start to thaw out. Someone must inspect your property ASAP. The purpose of this visit is to make sure that if no damage has already occurred, you may mitigate further damage in the following months ahead. 1.- Open all water faucets and flush all toilets. If the faucets and/or toilets do not run or have very low pressure, it is a sure sign that the pipe is freezing or frozen. By running the water faucets, you may also relieve the pressure that ultimately breaks piping. 2.- if you suspect you have a frozen pipe, make sure that the main water valve at your home is turned completely off. When water is not coming out of a specific tap or refilling a specific toilet, gently warm the connecting pipe with a hairdryer, starting at the faucet and working back. Seek help immediately by calling a plumber. A broken water pipe is a very expensive repair job, especially if not treated in time. 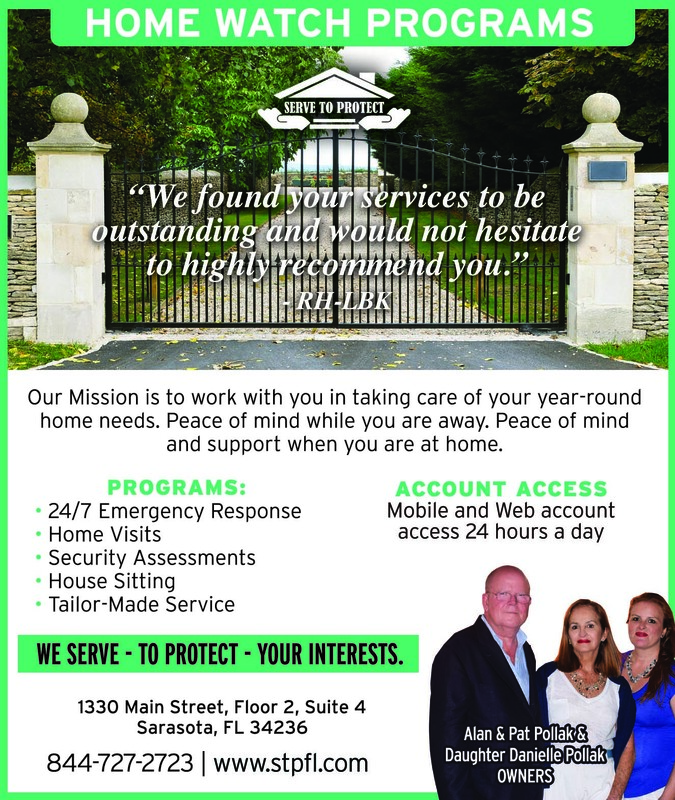 Serve to Protect LLC visits your home here in Sarasota on a regular basis when you are absent. A Weekly inspection of your winter home is also a basic necessity; to assure that your electric supply and heating are working properly. Serve To Protect will grant you Peace of Mind this New Year. Happy 2018. This year will be very busy and full of adventure. We are excited to start working with you when you return to your primary residence in the spring of this year. Our Home Watch Programs are designed to make you feel at home – when you are away, day in and day out. As we visit your home, we will provide you with detailed reporting on a regular basis plus two-way communication. As a dedicated Home watch service, we do not engage in Security or Property management services. We offer tailor-made solutions that will fit your needs. Our Family-owned business will be honored to serve and support your needs this year. Please call us. We will be delighted to meet you. Your Serve To Protect, LLC team! The purpose of this short note is to share with you what Serve to Protect experienced in the last 72 hours with Hurricane Irma, before and after the debacle. As local representatives and Key holders of our client’s properties, we will give you some basic insights of lessons learned. 1) Retrieving all objects outside the property which could be potential missiles to your property or your neighbor. 2) Conduct a yearly inspection to your roof so as to assure yourself that you do not have a potential weakness to your structure. 3) Hurricane shutters. Electrically operated shutters should be serviced and operational. Manual shutters need to be installed at least 72 hours before a potential storm. 4) Electrical cuts are inevitable. Unplug all electrical appliances and throw out Ice and perishables from fridge and freezer. A). Prepping your property does not mean that it is a safe place to weather the storm. You prep the property to protect your worldly possessions, NOT to safeguard the well-being of your loved ones inside the property. Sitting in a home that has shutters, no electricity and totally unaware of what is going on around your immediate surroundings could be a death trap. Storm surge and/or rain waters could engulf your home in a matter of minutes. B). Evacuation. Know your flood zones and religiously obey evacuation orders. If you are in a Zone A or B you know you will be in danger if the storm path is in your region. Do not wait. Prepare in anticipation what you will need as you evacuate and DO NOT wait till you receive orders to evacuate. Anticipate. C) We live in a Retirement Community. Be a good neighbor. Be aware of your surroundings and be of assistance to others. D) Pets. Many residents have Pets (as we do). If you have not had time to evacuate in anticipation of a storm, please seek shelter at a location that will accept pets. We had to stay put so as to perform emergency post storm visits to our client’s properties. We spent 2 days at Buffalo Creek Middle School, in Pinellas County. It was an amazing experience. We Sincerely thank the Staff and volunteers at this facility. Heading towards LBK in St. Armands Circle. Tree down. 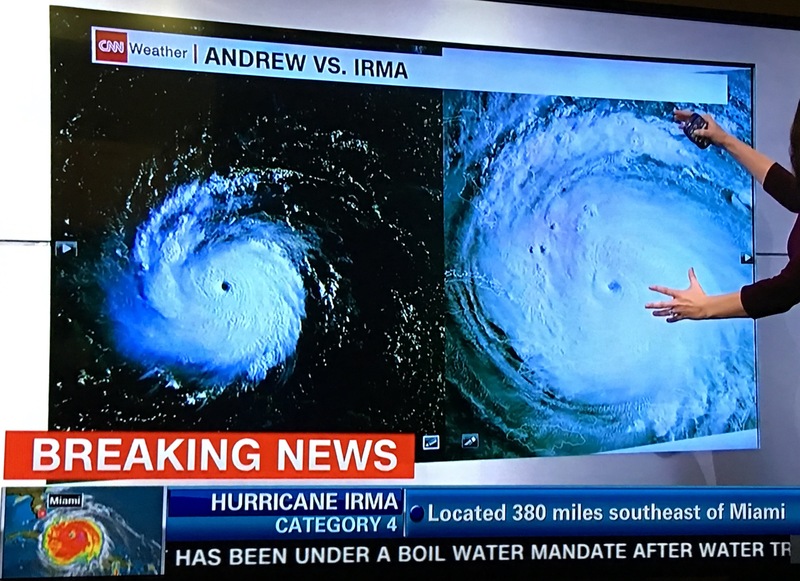 80% of all fatalities in Tropical Storms and Hurricanes occur AFTER the inclement weather has passed. Some causes are drowning by driving in submerged roads, accidents with fallen debris, electrocution by downed live electrical wires, post storm surges; to name a few. As you strictly obey evacuation orders, you should be patient and only return to your home when the authorities allow you to do so. 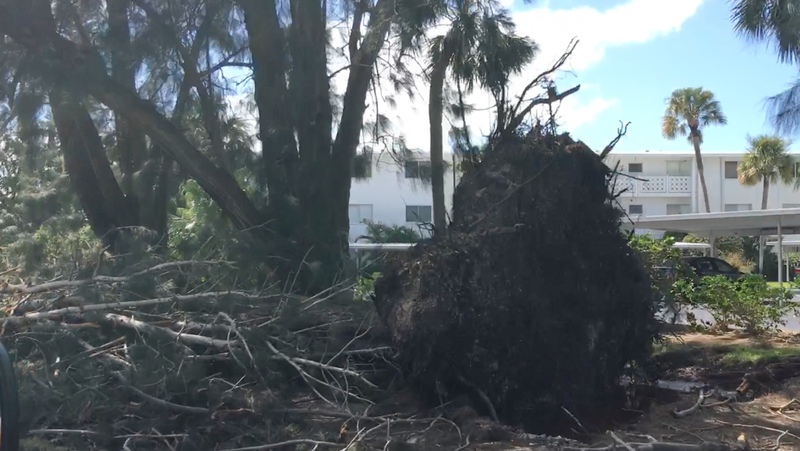 Sarasota and its surrounding regions were guaranteed a Cat 4 hit, were it not for Irma weakening by going over Cuba and taking a north-east path when it touched down in Florida. Luck spared us this time. Weather patterns are changing and we should, unfortunately, expect more activity of this type in the future. Serve to Protect was on-site visiting all its client’s properties within 24 hours after the storm passed. Barrier Island access was only allowed at 4 PM the day after the storm. We are pleased to inform that our client’s properties survived this terrible storm without major damage. In some cases, electrical connections may take some time to be re-established. Please contact us to schedule your complimentary House visit, we will be delighted to assist you in this critical process. The importance of “curb-appeal” when listing your property for sale. The first Impression always counts, “Curb-appeal” is so important when listing your property, allow us at Serve to Protect to provide you with additional Peace of Mind. As we all know the sales listing process is sometimes lengthy. A good realtor is critical because they can represent you, and importantly, give you good advice with respect to the market and recommended price ranges you should consider. Sometimes, the sales process can take 90-120 days or longer. First impressions count. Your ability to sell your property in the shortest time and at the best price possible is directly correlated to what insiders refer to as “curb appeal.” A buyer will seriously consider a bid if the property is pristine and well looked after. A good home watch service provider will not sell your property. They will assist in the selling process by bringing peace of mind to the seller that there is a caretaker looking after your best interests. Weekly visits with detailed date/time stamped reports are also helpful so as to show the prospective buyer that the home has been taken care for, through the listing process. Please contact us at www.stpfl.com to schedule your complimentary house visit, we will be delighted to assist you in this critical process. Serve To Protect your #investment while you are away! What made you decide to invest in #Sarasota? Did your job bring you here? Did family bring you here? 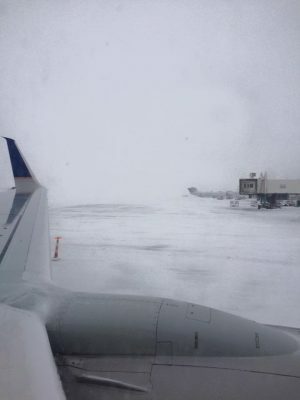 Winter was coming and it became unbearable; therefore, was your answer living half the year as a #snowbird? Investing in a property whether you want to play Golf, Surf or simply be near our beautiful Beaches; can be very painless just hire us, that is the key! Vist Programs. Now what? Who is taking care of your investment? We are your eyes while you are away! Many families decide to buy property and built houses with a 3-year plan. 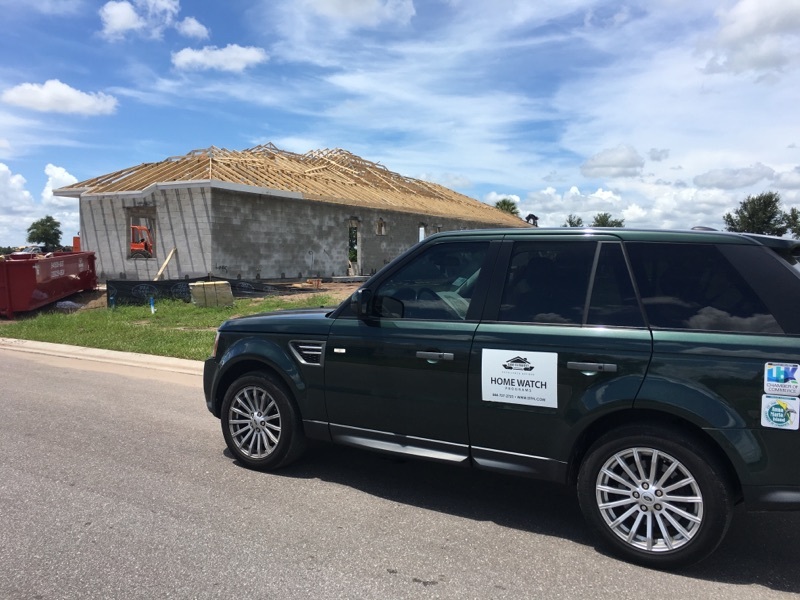 There are many new constructions in the market and Sarasota is Growing. We at Serve to Protect, LLC understand the anxiety of not being able to watch closely your property development. If you are someone whose property is just a project still waiting to happen. We can help as well. As our client, our services will include weekly visitations to properties being developed, it gives you access to reports sent by email, time and date stamped pictures on the progress of your property. Whatever is sent and more will be stored in our Portal with your own login and password for your keepsake and viewing pleasure. We will be building a relationship with you, our client, as well as your builders because taking care of your property should start as soon as your first brick is on the ground. One brick at a time is the foundation of our trust and Excellence. Are you thinking about leaving #SRQ and selling your property? No worries, we are here to offer you peace of mind during your selling process as well. Opening the property for third parties is not your Realtors responsibility, allow us to work with your realtor closely. Being able to be there to make sure your property is looking good allows your realtor to focus on what is really important: The sale of your property. We are here to take care of your interests while you are away, we will be You here in #SRQ providing you with peace of mind and helping you understand that we will be “YOU” while you are away. We have been in your situation and we understand your headaches. Schedule a complimentary visit today. Click here to request a visit by sending us an Inquiry. If you just arrived, are in the process of building, or are you just moving in? Come meet us, you will love our energy and we will start one brick at a time. Put First Things First – Before you leave, Is your #Sarasota home a priority? 1-Interviewed service providers, only after doing your due-diligence. Have you been to their Website, Facebook, Twitter, and other Social Media sites? How active are they in the community they serve? Are they part of a Chamber of Commerce or Business Alliance? Background of Co. owners and type of business structure (Family Business, Franchise etc) Commercial Insurance coverage; among others. 2- Visited their work location/office so as to establish their credentials. 3- Met the owners. Make sure they are able to cater to your individual needs. Your intuition will never guide you wrong. 4- Communication, What methods are used in Technology; will it be email, phone, online portal, transcribed voicemails? How can you be assured of a two-way communication method, which is reliable and trustworthy? “Serve To Protect” Is our Purpose “Excellence Defined” is in our DNA! 6- Third Party Vendors. The policy with regards to recommendations and conflict of interest Policies. 7- You decide who to hire. BEWARE. You get what you pay for. #Peaceofmind is #priceless. B) If your #Sarasota Home is Important and Non-Urgent, you have to follow the steps 1-6 outlined above and Procrastinate until last minute since it’s not really Urgent. Be Careful. The later in the season you seek solutions the more difficult it will be to find the right service provider for you. May of these top notch providers set a limit of new customers on-boarded per season so as to not risk degrading the quality of their service. e is available you might do some research Google to find a House Sitter. Be advised that requesting friends and neighbors is the quickest way to lose a relationship, and understand that your priority is not the same as others. 2- You might research for the less expensive house sitter, again BEWARE. You get what you pay for. 2- If you hire someone, you will do it a couple of days prior departure and it will only rely on the less expensive one. Whatever your priorities are, it’s important to measure your Importance and Urgency regarding your second home. Leaving a property behind is leaving your investment behind. I am hoping that this article sheds a light to where you stand regarding your Investment; awareness is the key. 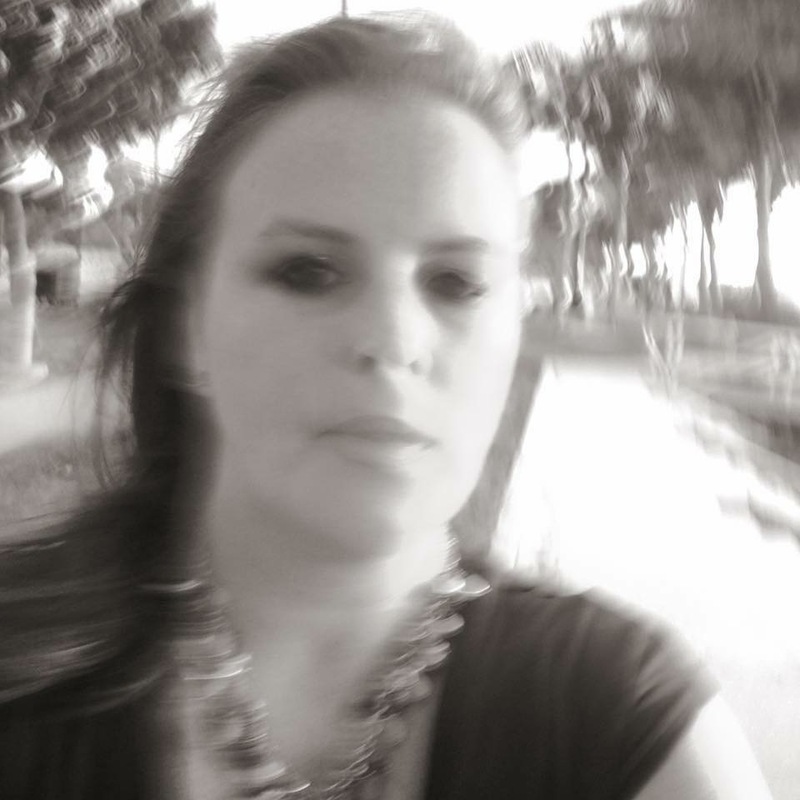 I will give Covey a break, my next blog will be about the Art of Procrastination and how intuition becomes your best friend in hiring a Home Sitter with the right Home Watch programs. We are here to help, Give us a call or contact us by visiting our website STPFL.com we will be very happy to schedule an appointment our Office or at your residence. We will accommodate you because, we at Serve To Protect, Llc, believe that our clients become our friends and are Important and Urgent. Second Habit: Begin with the End in Mind – What are your concern regarding your property? Begin with the End in Mind, is the second habit from #StephenCovey book “The #Sevenhabits of highly effective people” according to #FranklinCovey web, “To Begin with the End in Mind means to begin each day, task, or project with a clear vision of your #desireddirection and destination, and then continue by flexing your proactive muscles to make things happen.” Therefore if you are in the market for someone to look after your seasonal property you need to be aware of what you would like to get out of the home watch program service you are choosing. If you need insurance because your property stands on its own and you are not part of a gated community then you would need proof of your insurance that your property is being serviced by us at Serve To Protect. We would be able to help you get insurance and/or lower your insurance costs – Please get in touch with your insurance for detailed information on what we would need to provide. Why ask for bi-weekly visits? if your end in mind is just to get insurance or to show that your house is being attended to, we might help you. Some insurance cannot provide if no one is around for 3 consecutive months. What is your purpose for having a Home Watch service? If you begin with the end in mind you will understand how important is to have your home visited at least once a week or more times than that. We sincerely recommend once a week if not more. Water leaves DNA, any house inspector can give you details on the subject. 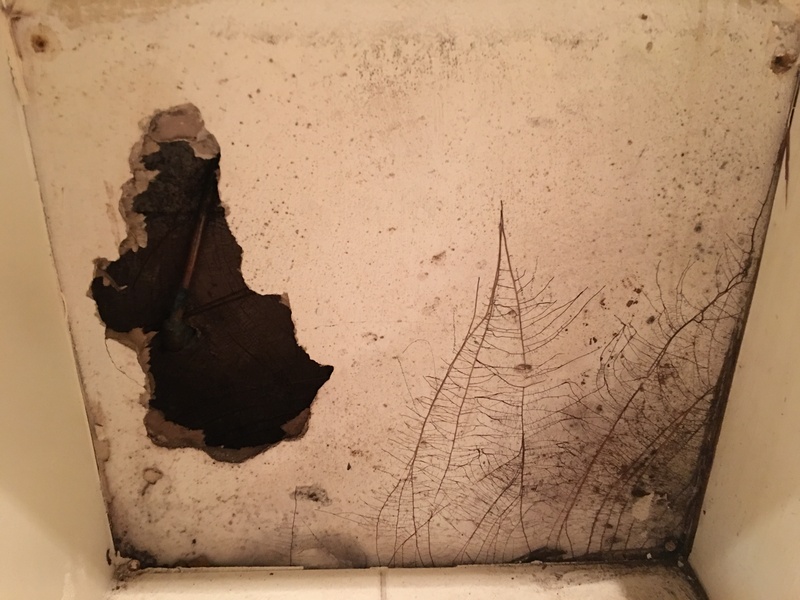 If there is water and is not taken care of that quickly can turn into Mold. Leaving water unattended for over 2 weeks is an error which can cost you big bucks in the long run. Ask your homeowner’s insurance if they will pay your claim after 2 weeks of humidity, speak to your insurance regarding the subject, know your policy so there are not surprises. Having a clear outlook of what you want to take out of the service is, to begin with, the end in mind, and it ties to being proactive which is the first of Steven Coveys Habits, click here to read about it. We can help in many ways. Please subscribe to our blog by submitting an Inquiry. We highly value your opinions and we are more than happy to address any issue or questions you might have. If you #signup with us before February 28th, 2017 we will provide you with #complementary #services. Give us a call contact us at STPFL.com. We look forward to your active feedback. What does Stephen Covey’s #SevenHabits of #Highlyeffective people have to do with your #Seasonal Property & the #Role Serve To Protect Plays? A while ago I attended a workshop related to a very successful book called “Seven Habits of Highly Effective People®” by #StephenCovey. Be Proactive, Take Responsibility for Your #Seasonal Property. Being #Proactive and taking responsibility for your seasonal property requires you to prioritize what is important to protect your #investment and the actions you must consider, in this regard. While you are away, the property must be cared for in the same manner as when you are in residence. It must not be neglected or left abandoned. An abandoned property will receive unsavory uninvited guests that will greet you upon your return with very unpleasant surprises. While you where away Surprise! What is your priority in regards to your home? Is it just an investment like many others or a home away from home? Is your home safe when you return? Are conditions to your home optimal upon arrival? How do you wish to #spendtime here in #Sarasota? Be Proactive, Take Responsibility for Your Seasonal Property and allow us to help you answer some of the above reflections by assessing your concerns to build your own #tailormade home watch program to provide #PeaceofMind while you are away and support when at home in #SRQ. If you sign up with us before February 28th, 2017 we will provide you with #complementary #services. We look forward for your active feedback.